The ‘ōhi‘a forms the major part of the forest in South Kona and in many places the trees attain good height and fairly large diameter. The ‘ōhia forest extends up to an elevation of about 4,000 feet. Bolte leased about 600-acres of koa forest lands in Papa, South Kona, and in 1906 he negotiated a contract to supply koa logs to the American-Hawaiian Mahogany Company in Petaluma, California. He shipped 30,000 feet of unsawed logs to the American-Hawaiian Mahogany Company in the first year of operation. In 1909, Bolte purchased sawmill equipment on the mainland and entered into a partnership with EH Cant to harvest ‘ōhi‘a in Pahoa. Cant and Bolte, Ltd. had picked up part of the Santa Fe Railroad contract that the Hawaiian Mahogany Lumber Company had. but lost. By 1914, the once large market for ‘ōhi‘a in the US had all but disappeared and by 1915 Bolte consolidated his lumber business back at Papa, South Kona, now on approximately 1,200 acres. He added a band saw and forty-two-inch circular saw used for sawing the logs. There was also a machine shop, a complete woodworking shop, a manager’s home, and six to ten workers’ cottages on the site. It was a modern sawmill, employing whatever machinery was practical in the rugged, steep terrain. Transporting the lumber to the shipping point was as difficult and costly as it had been 100 years earlier. The tortuous roads over the rugged lava were essentially wagon trails, and the lumber vehicles were in constant need of repair. The company was a major supplier of koa lumber to Honolulu’s largest koa furniture manufacturer, Fong Inn Company. The Papa Koa Lumber Company was in fact the main source of all commercial koa lumber during that time. Bolte died in April 1919 at the age sixty-five; two of his sons, Ernest and Fred, continued the business as Bolte Brothers Sawmills. In September 1919, only five months after Bolte’s death, Mauna Loa volcano erupted, destroying much of the company’s forest lands, but stopped short of the sawmill. The lava continued around and past the mill, destroying more forest lands on its way to the sea. The Bolte Brothers continued for two more years, until May 1921 when the Security Trust Company foreclosed on a loan made the year before. Wākea seduced his daughter, Hoʻohōkūkalani. Their first child was born prematurely; they named him Hāloa-naka (quivering long stalk.) They buried him in the earth and from that spot grew the first kalo (taro) plant. The second child, named Hāloa in honor of his elder brother, was the first Hawaiian Aliʻi Nui and became the ancestor of all the Hawaiian people. Thus kalo, which was the main staple of the people of old, is also the older brother of the Hawaiian race. Traditions on the island of Oʻahu provide the names of a dynasty of ruling chiefs including Mā’ilikūkahi, around 1500 (about the time Columbus crossed the Atlantic.) Māʻilikūkahi is said to have enacted a code of laws in which theft from the people by chiefs was forbidden. A son of Mā’ilikūkahi was Kalona-nui, who in turn had a son called Kalamakua. Kalamakua is said to have been responsible for developing large taro gardens in what was once a vast area of wet-taro cultivation on Oʻahu: the Waikiki-Kapahulu-Mōʻiliʻili-Mānoa area. 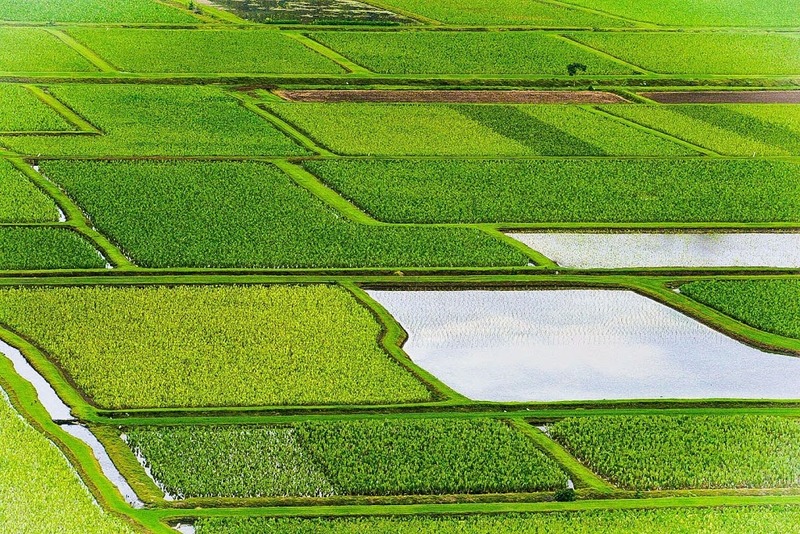 The extensive pond fields were irrigated by water drawn from the Mānoa and Pālolo Valley streams and large springs in the area. Other chiefs mentioned in Oʻahu traditions were associated with organizing activities in more systematic ways than those in times previous to them; one such high chief was Kākuhihewa. In pre-contact (prior to Captain Cook) times, kalo played a vital role in Hawaiian culture. It was not only the Hawaiians’ staple food, but the cultivation of kalo was at the very core of Hawaiian culture and identity. The early Hawaiians probably planted kalo in marshes near the mouths of rivers. Over years of progressive expansion of kalo lo‘i (flooded taro patches) up slopes and along rivers, kalo cultivation in Hawai‘i reached a unique level of engineering and sustainable sophistication. Hawaiians knew the productive advantages of growing wetland taro and placed the greater effort in this area very early, when required to increase food production capabilities for the rapidly increasing number of people. By the time of Captain Cook’s visits in 1778 and 1779, every large river valley in the islands contained many loʻi (pond fields,) and each was systematically irrigated by means of ditches delivering water to the fields spread throughout the valley. Usually, water was fed into an irrigation ditch from a stream. A loose-rock dam built across the stream allowed water to flow between and over the top of the rocks to provide for farmers living downstream. The dam functioned to raise the water level just high enough at that point to permit water to flow into the ditch leading to the terraces. In this way the amount and speed of the water could be controlled. If too much water was found to be flowing into the ditch, a few stones could be removed from the dam, thus lowering the water level and reducing the volume of water entering the ditch. The speed of the flow of water into the pondfields was controlled by the length and slope of the ditch. By varying the length and grade of the ditch, its builders were able to maintain a constant and low-level gradient over variegated terrain. The flow through the pond fields was controlled by the height of the terraces. On the question of the productivity of wet-land taro versus dry-land taro, some missionaries recorded their experiences and observations in 1847 and 1848. They helped answer the question: What number of people could be fed by one acre of land, of average quality in the district, if cultivated for kalo? Rev. Johnson of Hanalei, Kauaʻi, a noted wetland taro-producing valley, suggested that 25 people subsist on an acre of good taro land. Rev. Emerson lived and worked in Waialua District on Oʻahu where several large rivers and numerous springs watered the land. In 6 to 12-months, depending upon plant variety along with soil and water conditions, the taro is generally ready to harvest. Each parent tuber produces from two to 15 ʻohā, side tubers of corms, up to 6 inches in diameter. The Hawaiian concept of family, ‘ohana, is derived from the word ‘ohā (Fig., offspring, youngsters,) the axillary shoots of kalo that sprout from the main corm, the makua (parent.) Huli, cut from the tops of mauka and ‘ohā are then used for replanting to regenerate the cycle of kalo production. Taro or Kalo has been a traditional form of food sustenance and nutrition, particularly in ancient Hawaiian culture. Reportedly, it is the world’s fourteenth most-consumed vegetable. All parts of the plant are eaten, including poi, table taro (the cooked corm,) taro chips and luau leaf. The foregoing information (primarily from Marion Kelly and Lilikalā Kameʻeleihiwa (with some help from some others to fill some gaps)) helps answer some of the When, Why, Where and How Much questions related to wetland taro farming. The 22nd Annual East Maui Taro Festival is being held May 3-4, 2014. The image shows kalo (Markell.) In addition, I have included more related images in a folder of like name in the Photos section on my Facebook and Google+ pages. Hawaiian traditions describe the birth of the islands and the life that exists on them in terms of genealogical accounts. All natural forms of the environment are believed to be embodiments of gods and deities. From godly forces the Hawaiian Islands are born of Wākea (the expanse of the sky‐father) and Papahānaumoku (Papa who gave birth to the islands). It is from this genealogical line that Hawaiians address the environment and it forms the basis of the Hawaiian system of land use. In pre-Captain Cook times, taro played a vital role in Hawaiian culture. It was not only the Hawaiians’ staple food but the cultivation of kalo was at the very core of Hawaiian culture and identity. The Hawaiian concept of family, ‘ohana, is derived from the word ‘ohā (Fig., offspring, youngsters,) the axillary shoots of kalo that sprout from the main corm, the makua (parent.) Huli, cut from the tops of mauka, and ‘ohā are then used for replanting to regenerate the cycle of kalo production. In 6 to 12 months, depending upon plant variety along with soil and water conditions, the taro is generally ready to harvest. Each parent tuber produces from two to 15 ʻohā, side tubers of corms, up to 6 inches in diameter. Kalo patches are variously named on the basis of size, shape, planting method and other factors. Mo‘o ai are narrow strips of planted kalo, much longer than they are wide. Mo‘o kaupapa lo‘i are long rows of lo‘i or wet kalo patches. Other types of wet planting mounds include pu‘epu‘e hou and kipi or kipikipi. Of the wetland methods, lo‘i was most frequently occurring form. Kalo starch is one of the most nutritious, easily digested food. Kalo corms are high in carbohydrate in the form of starch and low in fat and protein, similar to many other root crops. The starch is 98.8 percent digestible, a quality attributed to its granule size, which is a tenth that of potato, making it ideal for people with digestive difficulties. The corm is an excellent source of potassium (higher than banana), carbohydrate for energy and fiber. When eaten regularly, kalo corm provides a good source of calcium and iron. Kalo leaves (lū‘au leaves) are eaten as a vegetable. Kalo, like other plants in its family, is considered poisonous when raw because its tissues contain an acrid component; thorough steaming or boiling eliminates this and allows it to be eaten. It is estimated that at the peak of kalo production, areas under its cultivation covered more than 20,000-acres (about 31 square miles) over six islands. Since the early to mid-1800s, kalo cultivation and the demand for kalo has markedly declined, and many of the ceremonial, medicinal and upland kalo cultivars became neglected and were lost. In 1900, it was estimated that about 1,280 acres were being used for kalo production. By 1907, rice had become a major crop, occupying about 10,000 acres. At that time, Chinese farmers were growing about half the kalo crop and milling 80 percent of the poi. By 1937, the major kalo growers were Japanese. With the outbreak of World War II in 1941, demand for kalo declined and production dropped to 920 acres. Today, less than 400 acres of kalo are planted. The 21st Annual East Maui Taro Festival will be held in Hana, Maui, 9 am – 5 pm, April 20-21, 2013, Hana Ballpark – Hauoli Road & Uakea Street. Hawaiian entertainment & Hula, 20 Food Booths, 50 Arts & Crafts Booths, an Info Tent for non-profits, an Ag Tent & Farmers Market and hands-on Cultural demos such as poi-pounding, kapa cloth making, creating Hawaiian musical instruments, lauhala weaving. Family-friendly and no admission charge. 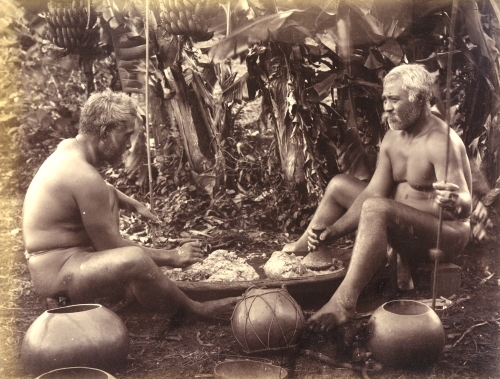 The image shows a couple of men pounding poi. (Lots of information here from CTAHR.) In addition, I have added some other related images in a folder of like name in the Photos section on my Facebook and Google+ pages.